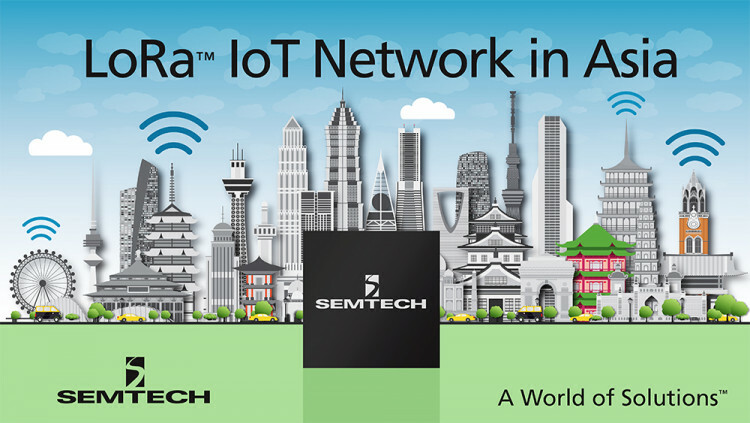 Semtech Corporation (Nasdaq: SMTC), a leading supplier of analog and mixed-signal semiconductors, today announced a LoRaWAN™ network based on LoRa® RF technology is being deployed by Asia Pacific Telecom (APT), one of Taiwan’s major mobile network operators. LoRa-enabled base stations (embedded with Semtech’s SX1301 baseband processor) and sensors (containing Semtech’s SX1272 and SX1276 transceiver chipsets) provide long-range, low-power connectivity among smart devices offering longer battery life and much lower infrastructure costs than alternative options. Foxconn, in partnership with Actility, a leading LoRa solutions provider, will provide both the software and hardware to launch the network, which is based on the LoRa Alliance™’s standardized LoRaWAN protocol to provide connectivity among the networks and IoT applications. Low Cost: LoRa reduces both up front infrastructure investments and operating costs, as well as end-node sensor costs. Asia Pacific Telecom Co., Ltd. provides telecommunication services to personal and business users primarily in Taiwan. Its services include broadband fixed line, broadband mobile communication, and broadband Internet services. All statements contained herein that are not statements of historical fact, including statements that use the words “will,” “expected to,” “provide,” “offering,” “to launch,” “aims to,” “to build,” “to enable,” “opportunity to,” “toward becoming,” or other similar words or expressions, that describe Semtech Corporation’s or its management’s future plans, objectives or goals are “forward-looking statements” and are made pursuant to the Safe-Harbor provisions of the Private Securities Litigation Reform Act of 1995, as amended. Such forward-looking statements involve known and unknown risks, uncertainties and other factors that could cause the actual results of Semtech Corporation to be materially different from the historical results and/or from any future results or outcomes expressed or implied by such forward-looking statements. Such factors are further addressed in Semtech Corporation’s annual and quarterly reports, and in other documents or reports, filed with the Securities and Exchange Commission (www.sec.gov) including, without limitation, information under the captions “Management's Discussion and Analysis of Financial Condition and Results of Operations” and “Risk Factors”. Semtech Corporation assumes no obligation to update any forward-looking statements in order to reflect events or circumstances that may arise after the date of this release, except as required by law. Semtech, the Semtech logo, LoRa and LoRaWAN are registered trademarks or service marks, of Semtech Corporation and/or its affiliates. Third-party trademarks or service marks mentioned herein are the property of their respective owners.